Exmoor ponies on Castle Hill NNR. Looking NW at N wall of outside toilet damaged by ponies. The past few dig days have been spent cleaning up the site ready for a hi-res 3-d laser scan from SeSurveying.co.uk. 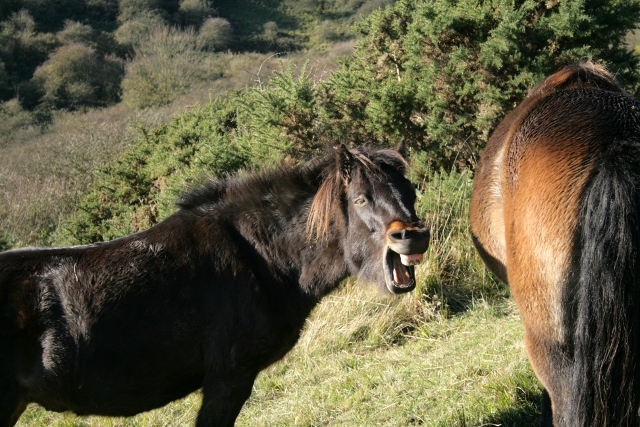 So we were somewhat frustrated to discover that Castle Hill nature reserve’s 15 Exmoor ponies had been partying all over our (almost nearly) clean archaeology! Hopefully our new strategically placed hazard tape will restrict their access to this corner of the reserve. 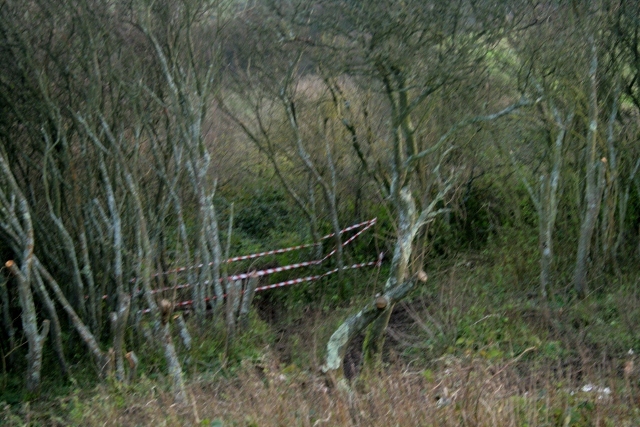 Hazard tape blocking access to dig site via path through prunus scrub. 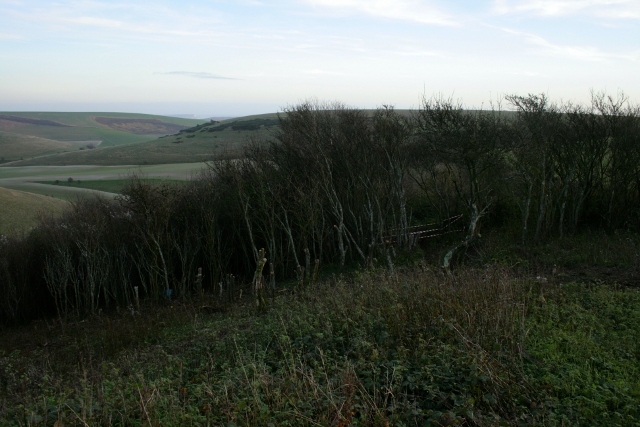 Looking NW at cottage site from demolition rubble mound. Looking S at boundary wall between toilet/garden/cottage and farmyard. 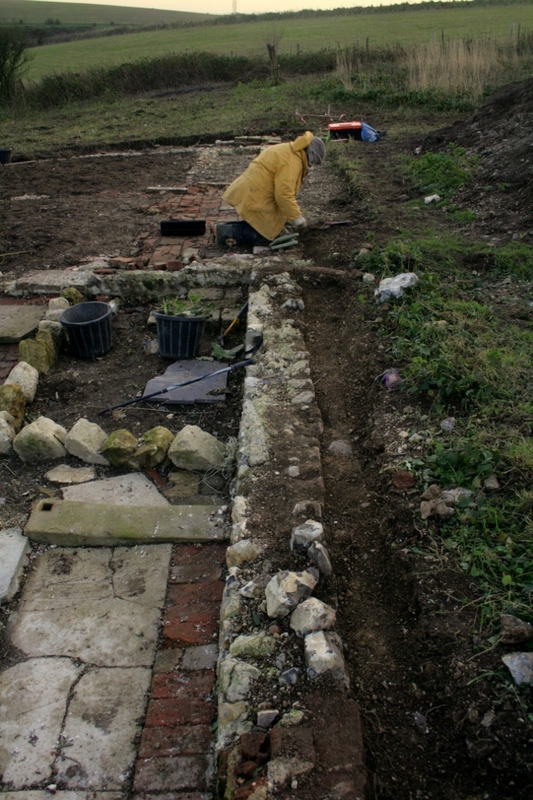 The west side of the garden/farmyard wall was further cleaned up, between the cottage and the front boundary of the site. 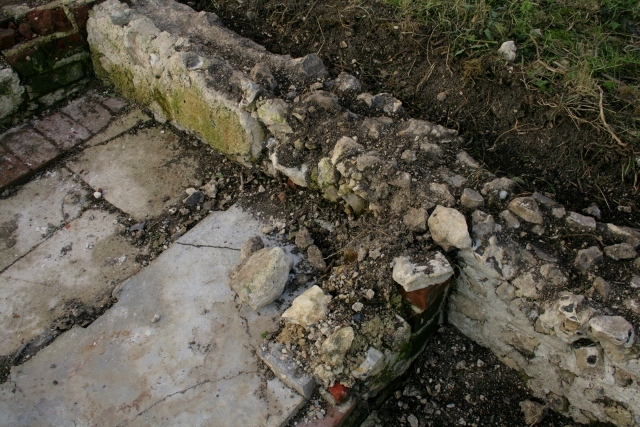 This wall butted against a chalk backfill, overlying a thin layer of mortar which may have formed part of the wall’s foundation. Its level was about a foot higher than that of the garden to its east. Looking W at water pipe over garden/farmyard wall a short distance in front of cottage. Looking S over water pipe, garden/farmyard wall, stone blocks, and NW corner of cottage walls. 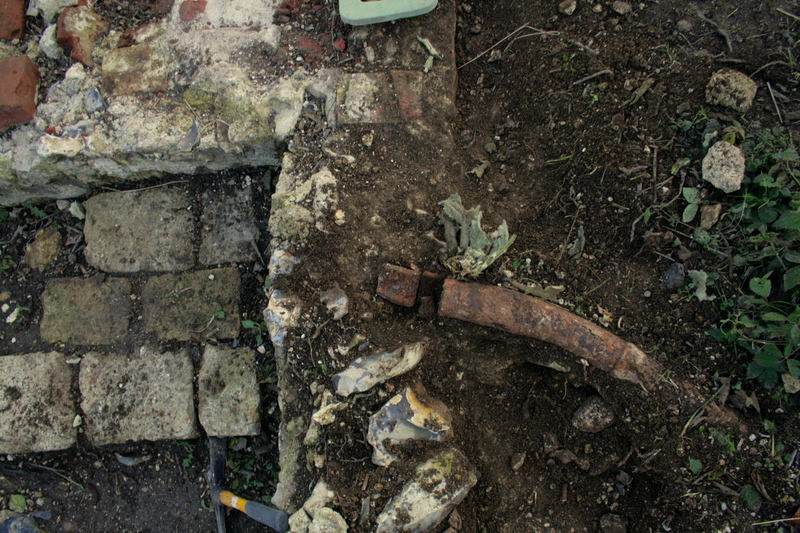 The end of the previously excavated iron water-pipe was also cleaned up, where it started to cross the wall; where it was cut by the bulldozer. It had been detected as having one end in the vicinity of (the site of) a big rain water tank in the east end of the nearby big barn. Its other end had previously been excavated, close to the modern ground surface directly above the cut flint wall, and was found to have been cut by the 1950’s bulldozer as it turned to run in an easterly direction parallel to the front of the cottage, just as it met the dividing farmyard/garden wall. This was a little over a foot to the north of the front corner of the cottage (see Second, Sixth, Tenth and Twelfth dig days). Directly against the front of the house, in the corner with this wall, 3 courses of stone blocks were horizontally laid, forming a roughly rectangular solid base. The pipe ended just a little over a foot above the centre of this base. Whilst I don’t rule out other possibilities, I now believe the most probable purpose of this pipe was to divert overflow from the barn’s rainwater tank to feed a relatively small water tank or barrel (perhaps 50 gall. ), which sat on this stone platform, conveniently situated by the washhouse/kitchen door. Rain water was soft and so preferred for washing than that of the hard water obtained from wells. 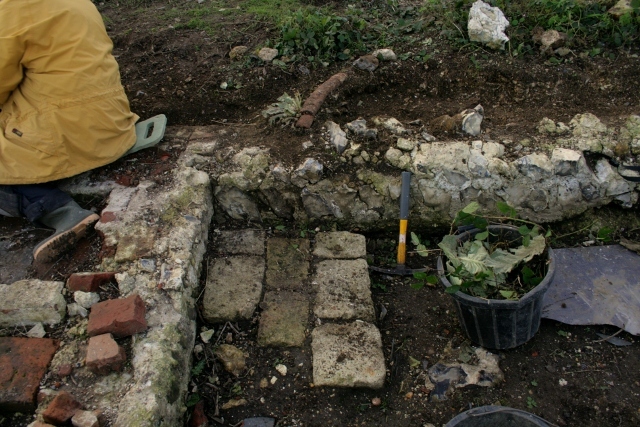 Looking NW at S end of E wall of cottage. 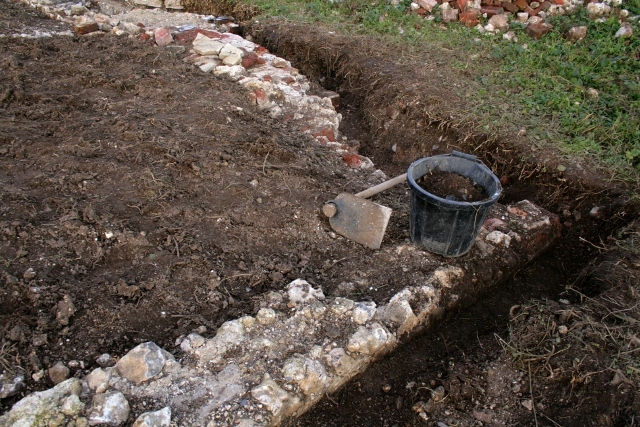 At the opposite end of the site, the outer faces of the south and east walls of the cottage were also cleaned up. 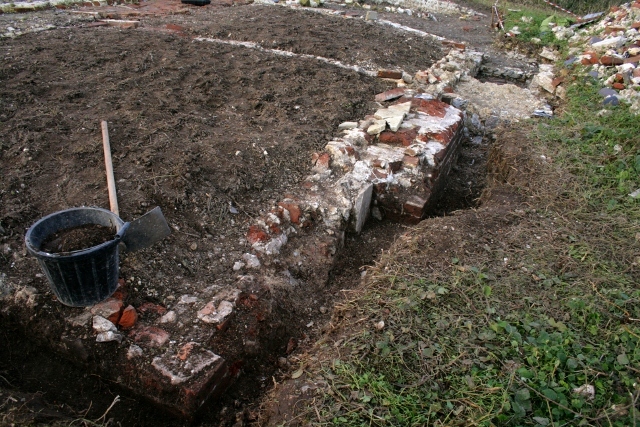 An area of the outer face of the east cottage wall between the chimney base and the south-east corner had been very badly damaged, probably by explosive ordnance. 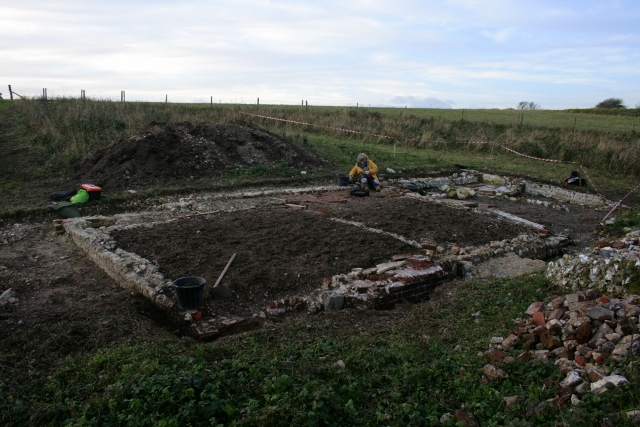 However, since the object was merely to clearly outline the width of the cottage’s walls, the full extent of the damage has yet to be excavated down to the original ground surface. At the base of the surrounding demolition fill there will be finds, but their excavation would have significantly slowed down our progress – they can be saved for later – if we get more volunteers. As it was, no finds were unearthed to the north of the cottage; to the east, just 1 rusty spring & the top of a glass bottle; to the south, just 2 shards of pot, a shard of milk bottle, a small metal spring and a rusty nail. Our first dig day in a long time with no blue & white ceramics or .303 cartridges! And our best sunset yet, with full moon in the east! 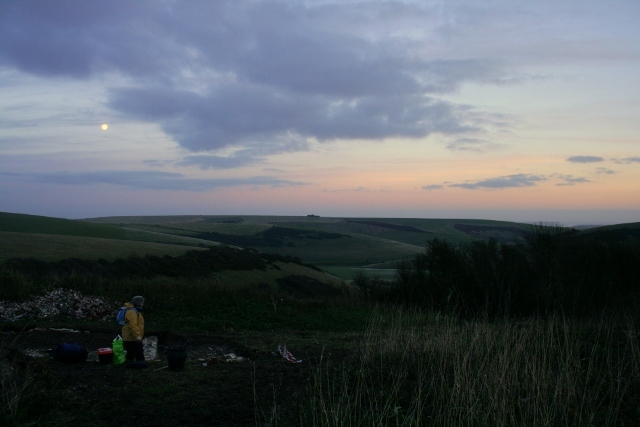 Loking E at sunset and full moon over dig site and Castle Hill NNR.